Do you like to talk about laughter? Or humor for that matter? Then stay tuned in this lesson coz we are gonna have a lot of fun talking about humor and also learning how to talk about humor. So let’s go. Let’s look at the words on the board. So these ones here are some ways to talk about humor. Yes, what is humor? Have you heard that word before? Humor means the ability to make someone laugh. Can you make someone laugh? Do your friends laugh at you when you crack jokes? Then you surely humorous and you have the ability to make someone laugh. Humor- ability to make someone laugh. Comedy, so comedy is a funny incident or a funny conversation that you’ve heard. Have you ever seen a situation, where a person is narrating a speech or their giving a speech and they suddenly forget some lines isn’t that a bit of a comedy? That is what comedy is. A funny situation that makes you laugh. Obviously a funny situation will make you laugh; it won’t make you cry after all. Let’s look at the next one, comedian. So a comedian is a person who does comedy, who makes others laugh. There’s another word. Same as comedian and that is humorous. A person who is humorous or who is a humorist. So humorist is a synonym for comedian and humor here is a synonym for comedy. Did you notice my pronunciation for the word, comedy? And comedian isn’t that a bit peculiar? So the word comedy has two syllables and the stress is on the first syllable. Comedy, this is the stressed syllable. But in this word, we have three syllables and the stress changes. Here it is comedian. So the stress is on, the second word. There is so much comedy in English, isn’t it? It’s the same word and just the difference is of syllables but still the stress changes, I can’t help it, sorry you gotta learn it. So humorist is a synonym for comedian, a person who makes others laugh. A person who makes others laugh. Okay this also makes me tell you about another word called a stand-up comedian. So people who you know do comedy on a stage, they are called stand up comedians. You must have seen some stage shows, so those people are called stand-up comedians. Stand-up comedian. Alright, with that we move on to the next one, dry humor, okay. So this is not dry literally but what this means is, that this kind of humor, is a bit clever. You need to be a bit smart to understand this humor. Okay let’s try whether you’re smart or not? so I’m gonna share a joke with you, if you laugh, then you’re smart and you have a good sense of dry humor and if you don’t then, I wouldn’t like to say anything about that. So dry humor, okay alright so, this is a very popular joke. This is lady, Nancy, between Lady Nancy and Winston Churchill, so t it’s like two people from history. So Lady Nancy told Winston Churchill, “Churchill if you were my husband, I’d add poison to your tea and Winston replied, “Nancy if I was your husband, I’d drink It.” tell me that you laughed, okay if you didn’t then I am so sorry. So this is kind of clever humor and this is also knows as wit. W-i-t or maybe even sarcasm. So these are some words that you can use in place of dry humor. Let’s look at the next word, facetious, yes that’s how it’s pronounced, comedy in English, exactly. Facetious, so facetious is actually untimely humor. let me give you an example, so let’s say your grandfather, he’s always been telling you that, your generation is relying too much on technology and he’s not well, he’s actually in the hospital and you suddenly think of that statement and you realize that your Grandpa is on a ventilator, on life support and he’s using the very technology that he criticizes you for using. so you are talking to your friend and you actually tell him, my grandpa always me that we are using too much technology, our generation is relying way too much on technology and then you say, what will happen if I take away the ventilator or remove the ventilator, the same technology that was helping you, is probably gonna do something with him. At this situation you’re being facetious and your humor is not at the right time and not about the right situation. So untimely humor, about a serious situation. So be careful about being facetious, it’s not really appreciated. Okay let’s look at the last one here, to talk about humor, it’s gag. Have you heard of a show on Pogo, laughing about gags or it’s all about gags, have you heard of it? Okay, I’ll tell you what it means; the word gags means, a small presentation of comedy by a stand-up comedian, a small presentation. So let’s say in a situation where, the stand-up comedian, you’re watching a show and the stand-up comedian has just come on stage and he does some opening gags about the previous band that was just performing. So he has started, he has done some small incidents or small expression of comedy, a small expression of comedy, okay. So we have learnt how to talk about humor but do you wanna know how to talk about laughter? Oh yes we all have different ways of laughing at different situations. Of course if there’s something very funny, you don’t smirk yes. You don’t smirk about something really funny. When do you smirk? So you smirk, when you defeat your opponent. Yes that’s like a self-satisfying smile. what happens here is, I’ll show you the expression, one corner of your face or of your lips goes upwards, it’s more like okay, I did something smart. So a self-satisfying mean laughter. Alright, self-satisfying and mean, clever laughter like this, okay. The next one, grin, oh I do that really often. Something like yay, where you’re having a broad smile on your face and it shows that you are very happy, just like me. So I’ll do the expression for you again, eeee. This is when you’re grinning. So you always about something very funny. Are you also grinning? Did I say something very funny? Ah… I know laughter is contagious. So a broad smile. So mostly when you’re grinning, you have your teeth, both of your jaws touching each other, upper jaw and lower jaw. That’s when you grin and snicker is also a synonym for grin. It also talks about a broad smile on your face. It means same as grinning. okay this is the most interesting for me, guffaw, guffaw is when you saw probably a really funny movie and a funny scene in the movie and you just can’t stop laughing. I mean your hands are waving, your torso is shaking, you are clapping your hands and almost the tears out of your eyes are just flowing out. That’s when you are guffawing, laughing just too much. Have you seen that all of these are in the increasing order? So smirk is a short smile, grin is a broad smile, snicker is a broader smile and guffaw is when you are actually laughing. Let’s look at die laughing, I’ll come to roar don’t worry. Die laughing is you know the next step after guffaw. This is like a moment of breathlessness because it says, die laughing. So you just can’t control your laughter and you feel like you’re almost gonna die, you feel choked, you can’t just stop laughing. So that moment is called die laughing and that’s extremities of laughter, breathlessness due to laughter. Oh I love such moments. Okay finally we have the last one, roar. Roar is obviously not talking about a lion here. Roar is when you don’t have an individual laugh. So here we are all talking about, all individual laughter but here we are talking about an audience that is laughing. So like an audience watching a comedy show or something like that. That’s an audience laughing. Roaring, more like the audience roared at the joke, like that, okay. So you’ve had a look at different ways of talking about humor and different ways of talking about laughter. don’t control your laughter and don’t control your smile, go smile, be bright, have fun and come back for another lesson with me, take care, bye. 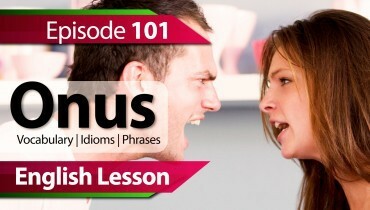 Previous Previous post: Speak vs Talk – What’s the difference between these two verbs. 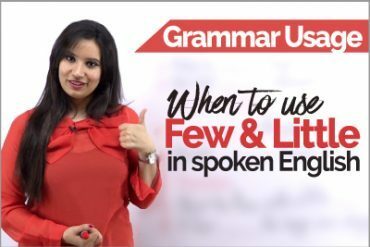 English Grammar Usage – How to use FEW & LITTLE correctly in Spoken English Conversations? 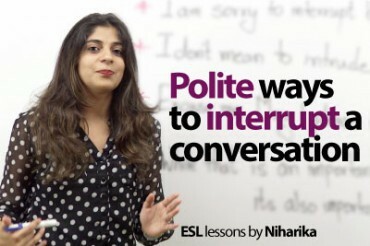 Etiquette rules to interrupt someone in English.